It alliterates, you see. Brilliant Books make Great Gifts. Brilliant Books. Great Gifts. B-B. G-G. But “brilliant” is better than “great”, surely? “Great” is only really one step up from “very good”, but “brilliant” is up there with “excellent”, “amazing”, “fantastic”. What this poster seems to be saying is that, somehow, the book gets slightly worse through the act of receiving it as a gift. That giving a book to someone reduces the quality of the book. It downgrades it from “brilliant” to great”. Of course, there’s nothing wrong with receiving a “great” gift. By definition, it would be great. But even to ensure that a book makes a great gift, you have to start with a book which is as brilliant as Cook Up A Feast by Mary Berry and Lucy Young, or the Lego Atlantis Brickmaster. What if the book isn’t so good? The Lego Atlantis Brickmaster gets five stars on Amazon, but the Lego Star Wars Brickmaster only gets four stars. If you then consider the negative impact of gifting on each book, you can probably knock a star off both, leaving you with a four-star and a three-star gift respectively. The Wine Opus starts out with only three and a half stars. Knock a star off that and you’re left with a two and a half star gift. We are now in the realms of the average. A dangerous zone. Basically, the message from Dorling Kindersley is clear: don’t give books as gifts. As a dignified and civil enterprise the publisher is suggesting that the giver of the gift – a literary type – might respond very enthusiastically to a book they had themselves read, calling it “brilliant”. But such a person would never presume that such a book would make an exceptional gift, because the person who inevitably determines this is the recipient. Dorling Kindersley represent their readers as quiet, modest types who give in hope, not with the arrogant certainty of those who do not regularly read books. Furthermore, by associating the word “brilliant” with books rather than gifts the advert fulfils its primary function of promoting books rather than gifts. 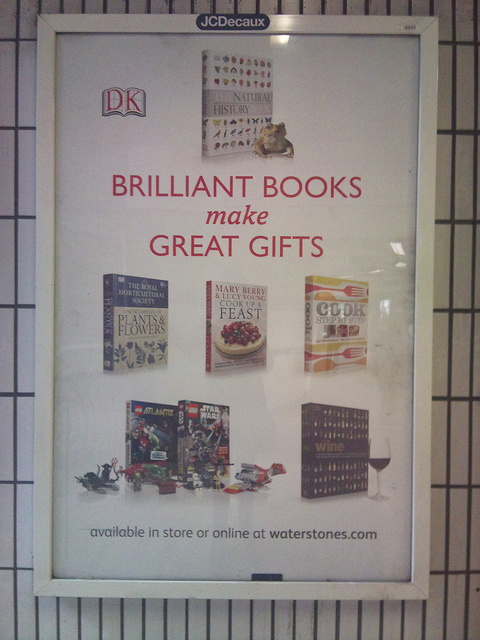 If everyone who sees the advert is subconsciously reprogrammed to think of brilliant gifts then Dorling Kindersley might not benefit at all, whereas if they rewrite our brains to associate brilliant with books then they stand a fair chance that their particular product will gain sales, whether as a gift or otherwise. In short, Dorling Kindersley love books first,; gifts are always secondary to them. In their innocence they have expressed this ordering of their priorities in their advertising and you are wrong to mock them. I like that Natural History book – it comes with a free frog. Lego Star Wars Brickmaster happens to be one of my favorite books.